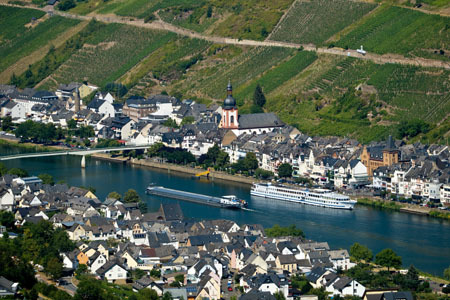 The Mosel valley is mostly open to the southwest and protected on the north and east. It is also sheltered from the rain by the Eifel and the Hunsrück. This gives it a special climate where frosts in spring (late frosts) or in the autumn (early frosts) are very rare. In other words, it is an ideal climate for cultivating the Riesling grape, the grape which not only needs the longest growing season, and but is also of the highest quality. Archaeological finds have proven that the Celtic Treverians already grew grapes for wine in this region. The actual development of Mosel wine began with a decree by the Roman Emperor Probus (278-280 AD) which allowed for its general cultivation. A good climate is not the only thing necessary for good wine. Soil also plays a decisive role. After the widening of the Trier valley, with its colourful and steep sandstone sides, the Mosel starts cutting deeply through the Rhenish slate mountains and meandering with extreme twists and turns ("Central Mosel"). The deep Kasten valley in the central Mosel area with its blue-green Hunsrück slate is characterized by its steep bulging and gentle "slip-off" slopes making it ideal for viticulture. Between Trarbach Traben-Trarbach and Treis-Karden northeast of Cochem, the valley becomes steeper and its floor narrower. This is where the lower Mosel area begins with its sloped terraces, high slopes planted with grapes, thick mountain forests and the steep valleys of the small tributaries ("Terrace Mosel"). The substratum is composed of layers of quartzite, reddish argillaceous slate and graywacke. The next time you enjoy a wine named "Zeller Schwarze Katz", an "Ürziger Würzgarten", a "Bernkasteler Doctor", a "Piesporter Goldtröpfchen" or a "Trittenheimer Apotheke", think about the fine differences between the lime and calcium rich soil of Hunsrück slate of the central Mosel and the argillaceous slate, rich in silicate and graywacke of the Terrace Mosel. The area around Zell was already populated in Celtic times, as the connecting path from the Hunsrück arrived at the Mosel here. The town itself was probably founded in Roman times, with a little port and storage halls for trading. The name "Zell" (Latin "cella"=basement/storage) probably refers to the town's function as a trading place. In 1222, Zell received city rights, and subsequently built a city wall with several towers and three city gates. The fortification of the city was completed in 1229, but only the "Bachturm" and the "Pulverturm" are preserved, symbols of Zell to this today. The city was owned by the Trier Electorate and even got a princely castle (completed in 1543), as a secondary residence of the Elector and the residence of a civil servant. A severe fire in 1848 destroyed many medieval buildings, but the historic old city kept much of its original charm.